Nurse Bridgid: Eating chocolate may keep you skinny! Let's not get too excited, but this is the kind of research I can get down with, seeing as I have quite a chocolate addiction...I have a few bites of chocolate almost every single day. Literally, a few bites, not a few candy bars. I've honestly always felt that if you crave something you might as well give yourself a little bit of it to satiate your craving, so you don't deprive yourself then go bonkers the next time you have it, right? Makes sense to me! And, it works for me too! So, the study that just came out showing that people who eat chocolate more, have a lower Body Mass Index (BMI) an tend to be happier. I correlate with that, but I work out a ton and am not the average person as far as work and lifestyle is concerned! So the study wasn't initially intended to find out this amazing news about chocolate (even though it makes all chocoholics super excited!) It was actually survey of people who take cholesterol lowering medications, know as statins. 1017 people were surveyed related to their chocolate intake, form ages 20 to 85, and they were all relatively healthy people without any cardiac disease, diabetes, or extreme cholesterol levels. They assessed all aspects of these peoples lives including: exercise, daily calorie intake, frequency of chocolate intake (i.e. how many times a week), overall saturated fat intake, and happiness (they used an accepted depression screening test). And, for 978 of the people surveyed had their BMI's measured. A BMI is a scale that uses height and weight to estimate you and scales you as underweight (<18.5), normal weight (18.5-24.9),overweight (25-29.9), or obese (30+). I want to be very clear that a BMI is not a great estimate to use if you have a lot of muscle- it won't take that into account and it will say that you are obese (just an FYI). 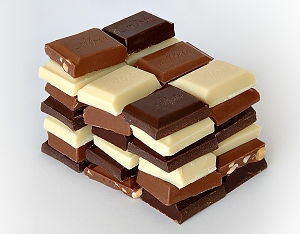 They found the moire frequently people ate chocolate, the lower their BMI, and the happier they are! So I eat chocolate every day and then I'll be skinny? NO! I think we all wish that one was true, and some people will trick themselves to think that is real, but it isn't. They found a correlation between the frequency that people ate chocolate and lower BMI's BUT they did not find a correlation between the amounts they ate. What does that mean? Basically, people who got the hankering for some chocolate and, for example, ate a couple pieces of chocolate a few times a week, had lower BMIs. It does not mean that people who get the hankering for chocolate who eat an entire chocolate bar or a pint of Ben & Jerry's have a lower BMI. They are doing further correlations and some follow-up study work, but it looks like living in moderation including indulging in moderation is the way to be: keeps you slim, makes you happy, thus making you feel better about yourself. So, keep active getting your minimum of 30 minutes of exercise in a day, eat healthy, and give yourself a candy break every now and again because you deserve it! Why is fish oil so great? Fish that live in your urethra!?!? Citrus fruits can save your life?